With summer in full swing and the 4th of July coming up, it is really hard to concentrate on business. I'm sure like everyone else, I'd rather play than work, so I've set a goal for myself to list a new painting in my Etsy Shop every Monday or Tuesday throughout the months of July and August. It seems a regular schedule is going to be necessary to keep me focused on commerce. Though I continue to paint without trouble, focusing on the business end of life is a bit more of a challenge. With my new goal in mind, here is the painting I've listed today. 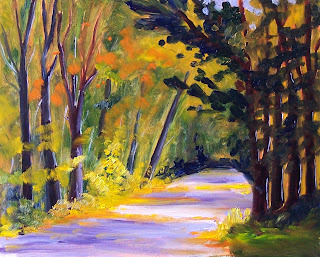 This 8x 10 inch landscape oil painting was inspired by a stroll down Five-Mile Drive in Point Defiance Park last fall. Five-Mile Drive winds its way through a lovely forest of old growth fir, cedar, and maples that turn wonderful shades of yellow and orange as autumn begins. The painting can be purchased for $125.00 plus $12.00 shipping to US addresses by clicking here. 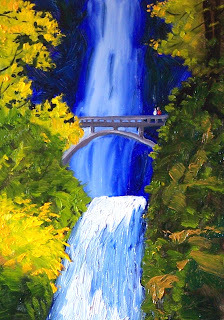 If you would like to see the location that inspired this painting, you can go to Paintmap.com, search for Tacoma, Washington, and zoom out twice with the little negative sign at the top left of the map. There is nothing like walking into a cool forest on a hot summer day. The Pacific Northwest is full of such forests. Tall firs and mossy corners offer relief during the warm record-breaking temperatures we've been experiencing. Camping is a popular summer past time. 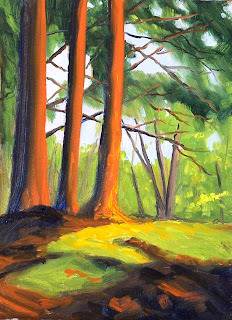 This 5x7 inch oil painting was inspired by a walk through a Washington State campground. Summertime, summertime--the time for travelling and sight seeing. Mountain waterfalls are tumbling downhill at full speed. Visit Mount Rainier National Park in Washington State if you want to see some beautiful waterfalls and amazing vistas. I'm still hoping for a trip to the Washington coast. I love to sit and watch the surf roll in and the clouds lumber across the sky. 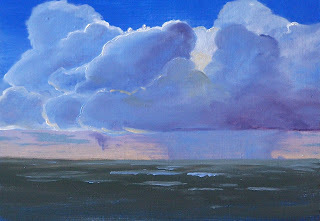 This little painting was inspired by cloud formations that form out at sea. Watching storm activity is a special treat when vacationing on the coast. This painting is 5x7 inches on a gessoed hardboard. A recent visit to the Rhododendron Garden at Point Defiance Park in Pierce County, Washington State resulted in this little painting. The rhododendron garden is in a natural forest filled with rhododendrons, sword ferns, and tall trees. On a spring day, sunlight sifts in and out amongst the towering old growth trees. This particular view focuses on the brilliance of sun-drenched shrubery sparkling in a glow of sunshine. This painting is a small 8x10 study that I used as a resource for a larger 24x30 inch painting of the same subject. 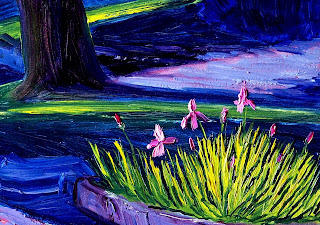 Painting this scene was a delight to view and to paint. This weekend was quite busy. Painting, preparing surfaces and sorting magazines ( more about that in a minute.) This morning I listed this little 5x7 oil painting in my Etsy Shop. It was inspired by one of my visits to the Nisqually Wildlife Refuge. It was fall and the leaves on the maple trees were a brilliant red. It is a beautiful place to visit. You can purchase this little painting for $35.00 plus $6.50 for shipping to US addresses by clicking here. My goal for the remainder of the summer is to list a new painting every Monday or Tuesday through June, July, and August in my Etsy shop. The bigest challenge of the weekend was sorting through a 25-year collection of Qulting Magazines. Dating from 1980 through 2004 this was quite an undertaking. My living room is piled with stacks of magazines sorted by year and publication. I will be selling these throughout the summer on Ebay. So, if you are interested in quilting, visit my listings at Ebay and you will find a vast collection of patterns, instruction, and articles available. Clearly this is a painting that is not one of my usual subjects. The painting resulted from a challenge in an online art forum that I often visit. The challenge was to paint this scene using only two colors plus black and white. The colors I used were yellow ochre and burnt sienna. It was wonderful trying to create the sensation of blue water when blue wasn't on my palette. A mixture of black and white produces a neutral gray that looks blue next to the yellow. The glow in the sky was developed by starting with a wash of burnt sienna that blended into yellow ochre. 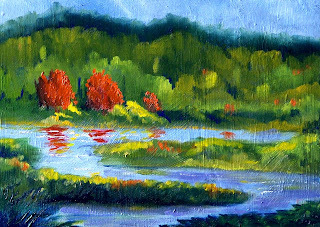 Over the wash I used the same gray mixture used on the water, letting some of the color show through. 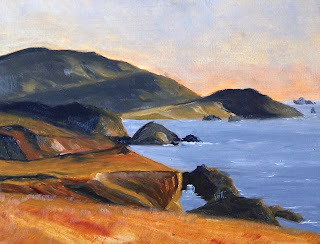 I understand why California plein air paintings are so popular; California has a lovely warmth to the landscape that is appealing to northerners with cold hands and feet. When I imagine sitting on a warm coastline such as this one, the chill leaves my bones. The painting is an 8x10 inch oil painting on gessoed hardboard. This 5x7 inch oil painting is the portrait version of the scene I posted yesterday. Although the path becomes less important in this scene, the heighth of the tree is emphasized. Since the tree was my original inspiration, I am somewhat partial to this version. I'd love it if my readers would leave a comment an let me know which version you prefer. I'm debating a larger version and can't make up my mind which way to go. 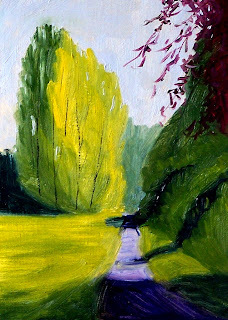 This 8x10 oil painting is a view of the path at Delong Park in Tacoma, Washington. The path leads to a wetland preserve. The open grasslands in contrast with the tall trees caught my attention earlier this spring and I have been pondering it ever since. 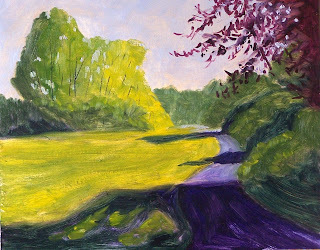 Although the work is not painted plein air, I followed Kevin Macpherson's suggestions in his latest book, Landscape Painting Inside & Out, for creating this quick study in a plein air fashion. It amazed me how quickly I was able to render the basic shapes and colors following Kevin's explanations. It took me less than an hour to complete this rough study. 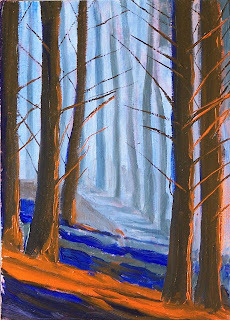 I also painted a portrait view of the trees and path that I will post tomorrow. 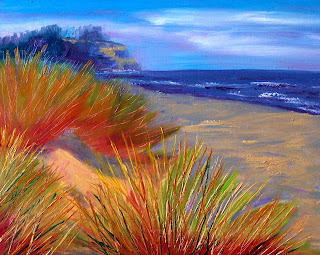 Another beach grass painting has emerged from my easel. 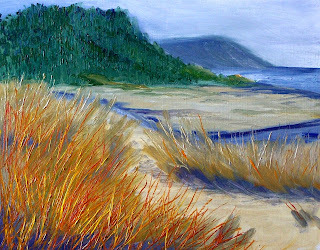 Beach grass is fascinating because it changes color throughout the day and across the seasons. The last of the evening sunlight on a summer evening prompted this rendition. A red glow broadcasts from those last dwindling rays of sunshine at the end of a summer's day. This painting is 8x10 on gessoed hardboard. I've been longing for a trip to the Washington Coast, but the weather has been so cold lately, I'm afraid it will feel like winter. This 8x10 inch oil painting will have to suffice until I can travel. The cool colors remind me of winter; I hope warm weather will arrive soon so I can have a wonderfully warm visit when I finally get a chance to visit the coast. 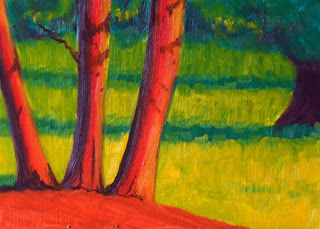 I have painted this scene several times because I am drawn to the color of the trees. In this painting Cadmium Yellow, Yellow Ochre, Ultramarine Blue, Alizarin Crimson, and Zinc White were used in addition to leftover paint from some previous work. I recycled my paint by scraping my pallette after a previous painting, mixing all the left overs together, and plopping the pile onto a corner of my pallette. It created a neutral green that worked well in this landscape. The hills in the background were created exclusively using my leftover paint and adding blue and white to adjust the values. I liked the neutral green as it could be so easily modified by adding another color. 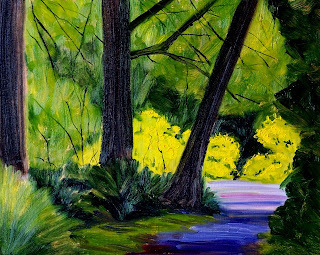 The underbrush below the trees was developed with the leftover paint and a little Cadmium Yellow. The rocks in the foreground were left over paint and Zinc White. I used a little Ultramarine Blue to create the shadows on the rocks. 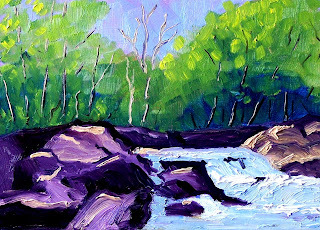 Adding more blue to the left overs finished off the river. The exercise resulted in some satisfying work. 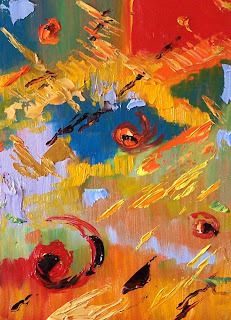 The painting is 5x7 inches on a gessoed hardboard surface. Rivers are running high and Washington State has the deepest snowpack experienced in years. Amazingly enough, it snowed in June in the mountain passes. It has been the coldest spring since sometime in the late 1800's. But the good part is, we have no flooding, no tornadoes, no drought, and the sun was shinning today. Happy Father's Day to all you fathers. I hope you have a chance to go fishing or rafting on a river like this one. Enjoy the day! 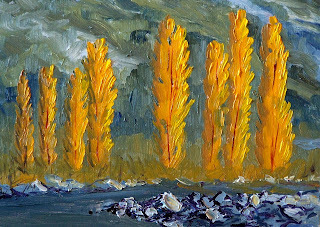 This oil painting is 5x7 inches on gessoed MDF board. Painting the sun always makes me feel good. This 5x7 miniature oil painting is no exception. The warmth of late afternoon sun was an appealing element of today's work. 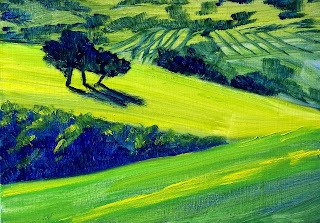 Long shadows and distant fields added to the mood--a great place to be after a long summer day. 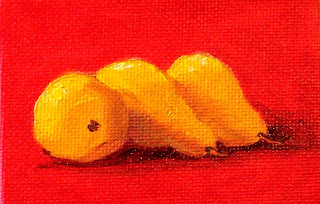 Miniature paintings of this size are not something I do often. 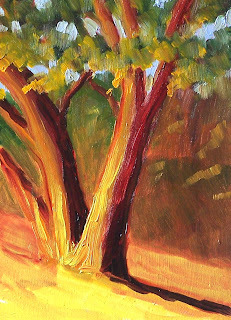 This bright little original oil painting is only 2.5x3.5 inches--a fun little size. It is painted on a canvas panel with professional grade oil paint. I've listed it for sale this week in my Etsy Shop. It can be purchased for $12.00 plus $1.50 for shipping by clicking here. Although the composition of this painting is the same as the one I posted yesterday, the palette is cool. This is probably the most realistic of the four in this series of color studies. I probably won't post the other two studies. The high key and law key versions are my least favorite. If you are interested, you can visit my photostream at Flickr to see the other two versions. This past weekend I worked on some color studies. This one was my favorite. I painted the same simple landscape four times. The first study I focused on vlues in a high key. I may post the results later in the week. The second study I focused on values in a lower key--an interesting comparison. Perhaps I'll post it later as well. This 5x7 study is the third effort. I used a limited palette of Cadmium Yellow, Napthol Red, and Cerulean Blue Hue. To say the painting was "warm" is a bit of an understatement. It resulted in some really hot colors, but I liked it best. The final version of the landscape was a limited palette of "cool colors." It was interesting to see the comparison of the warm and cool palette. The cool palette was comprised of Ultramarine Blue, Cadmium Lemon, and Alizarin Crimson. Although both paintings produced sunny results, the "cool" palette was a little more realistic. I'm a colorist at heart, so the painting above was the most attractive to me. I used the Artist's Color Wheel and the Artist's Value Wheel at Handprint to help me in these exercises. They were so handy I added them as a permanent feature to my blog. Check the links in the right column if you think they might be useful. As I mentioned yesterday, I painted this clump of iris twice. Yesterday I concentrated on the colors of late afternoon. This painting is a nocternal view. Blue became a dominant color as I worked the translation. A trip to Point Defiance Park in Washington State resulted in this 5x7 inch study which I painted twice, working on color temperature and value. I'll post the other version tomorrow. 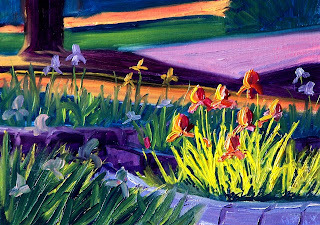 The late afternoon sun sifting across a bed of Iris inspired my work. A bright spot of sunlight provided the focal point. Lately I've been working larger whenever I can squeeze it in. 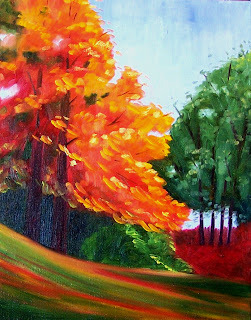 This particular 16x20 inch oil painting on stretched canvas was created from an earlier study. You can click here if you'd like to see the original small study. I made some minor changes, but I think you'll recognize the composition. I have a box of 24x30 inch gallery wrapped canvases in my basement waiting for paint, so I'll be doing some more larger works soon. Even though my blog is dedicated to my smaller works, I may sneak a big one in occasionally. Check back often if you want a surprise. Today's posting is an experiment from the weekend. As my regular readers know, my work is generally comprised of landscape and still life work; but recently an urge to try something radically different has been haunting me. My imagination has been captured by swatches of color and shape. What finally spurred me on to attempt an non-representational painting was reading Linda Blondheim Art Notes in which she discussed her alter ego and the limitations of branding. While she is best known for her landscape work, she had an urge similar to mine. Her desire led to painting abstracts under an assumed name. You can read the inspirational post here. While I didn't follow her in the direction of creating an assumed name, I thoroughly enjoyed creating this small 5x7 oil painting. I'd like to invite your comments. Should I work abstractly again or should I stick to landscape and still life? Your feedback would be appreciated. Late afternoon? Or maybe it was early evening? 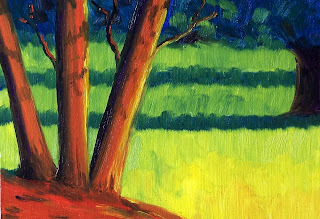 Either way it was the sunlight that inspired this 5x7 inch oil painting. I loved the long shadows created by the late-day sun, so warm and wonderful.